In 1996, nearly 20 years ago, the National Transportation Safety Board asked the states to strengthen their child passenger safety laws to make sure that all children are properly restrained in a child safety seat or booster seat and that they ride in the back seats of cars. The NTSB cited 1994 data that said that more than half of children fatally injured in motor vehicle crashes (647 out of 1,203) were unrestrained. They were twice as likely to die as restrained children. Had they lived, those 647 children would be adults today. They would be working their first real jobs, or like my son who was born in 1996, they would be going back to school for the fall semester. Some would be raising children of their own. Motor vehicle crashes are still a leading cause of death for children age 4 and the second leading cause of death for children age 3 and every age 5 through 14. On average, 3 children are killed and more than 400 are injured in traffic crashes every day. In 2013, 307 children died completely unrestrained in motor vehicle crashes. They didn’t have to. Car seats, booster seats, and seat belts, used effectively, save lives. Car seats are 71 percent effective in reducing the risk of death to infants and 54 percent effective for children between the ages of 1 and 4. As a volunteer Child Passenger Safety technician I’ve been trained on how to install all varieties of seats in many types of passenger vehicles. But even more importantly, I’m a mom – and one day, I want to be a grandmother. And perhaps the single most important thing I can do to make that happen is to make sure that my daughters, ages 5 and 10, are riding in properly installed car seats and booster seats—just as my son did. As a technician, I walk parents and caregivers through the process of installing their car seats. I demonstrate how to use all their features. I send parents away capable of ensuring that the seat stays properly installed, and armed with the knowledge to provide the maximum safety benefit every time they drive their children somewhere. Children need to be in car seats or booster seats until they fit an adult seat belt properly. Seat belts are designed to protect adults and do not properly fit children until they are at least 4’9” tall. Keep your children in a rear-facing car seat for as long as possible – at least until age 2. Keep your children in a forward-facing car seat with a harness until they reach the maximum height or weight limit for the seat. All children should ride properly restrained in the back seat. If you’re flying, don’t check your car seat like you do your luggage! Even in a plane, children are at risk if they aren’t properly secure in their own seat using a car seat or seat belt. 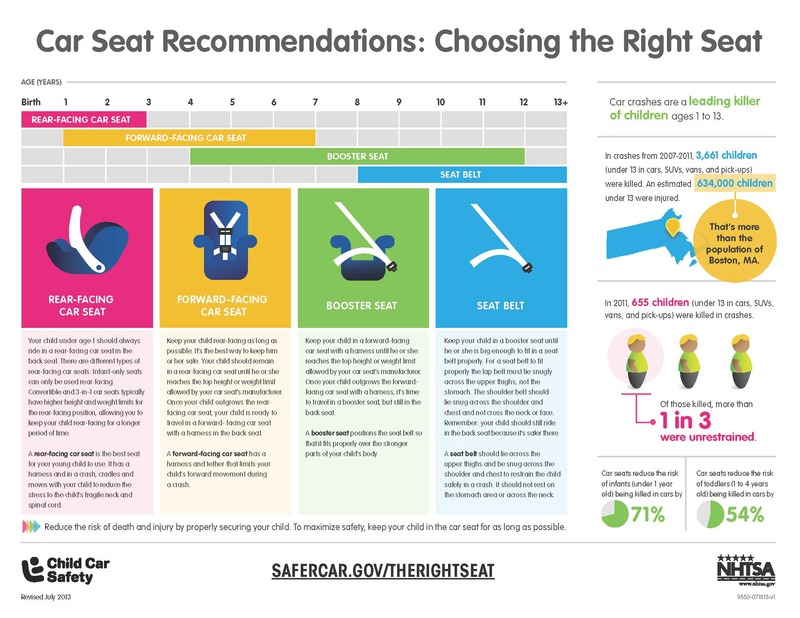 In communities all across the country, child passenger safety technicians and advocates like me are working to ensure that parents and caregivers are correctly using the right passenger restraints for the children in their care, whether that is a rear- or forward-facing car seat, booster seat, or a seat belt. If you’re concerned that you may not be using your seat correctly or have questions about the seat your child should be using, I encourage you to find a free hands-on event near you. Your children – and grandchildren – are counting on you. Saturday, September 19, is National Seat Check Saturday, to find an event in your community visit http://www.safekids.org/events. Stephanie Shaw is a Safety Advocate in the NTSB Office of Communications. Previous PostThe Cranbury Crash Proves the Need for Better Collision TechnologiesNext PostChin Up…and Avoid Distraction!